How I Achieve "Inbox Zero" | ed. tech. for. me. | ed. tech. for. me. 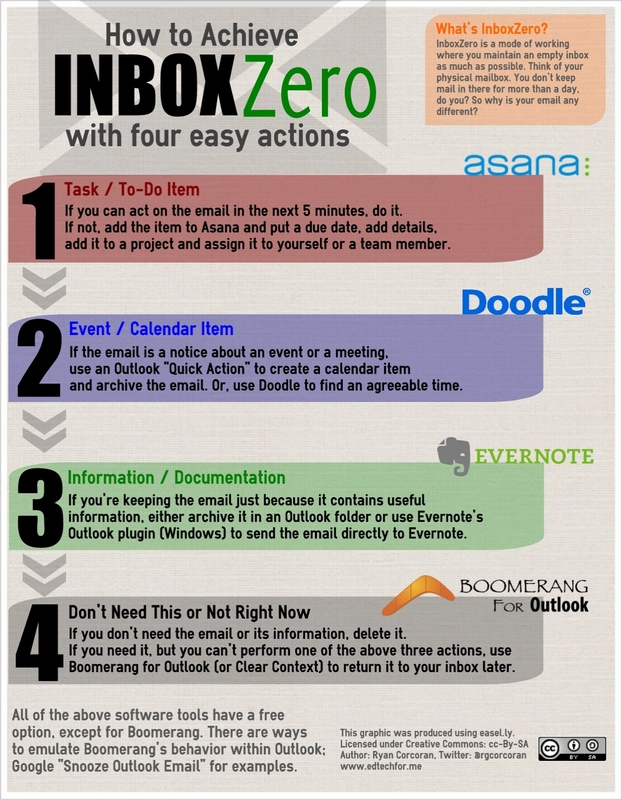 “How to Achieve InboxZero”. Licensed under Creative Commons: CC-By-SA, 2014. If you’re like me, you often get buried in your email inbox. While I’m still working on my personal email account, my work email is now fully under control, and I have been able to maintain “Inbox Zero” status. If you’re not familiar with “Inbox Zero,” it is a buzz word that’s been going around the Internet since the dawn of the GTD (“Getting Things Done”) movement. The concept is that you work to keep your email inbox empty just as you would your physical US Postal mailbox. Think about it–you don’t leave hundreds of letters/magazines/junkmail in your physical mailbox, do you? Then why do you let that stuff clog up your email inbox? Is this something I need to act on? If yes, then can I act on it in the next five minutes (or whatever available time I have right now)? If yes, then I do it. If I can’t act on it now, I add it to my asana.com project list. Is this an event or calendar item? If yes, I either use a Quick Action I created in Outlook to automatically create a calendar item and archive the original email, or I use my Doodle.com account to schedule a meeting or request a meeting. Do I need to keep this because of the information in it? If it’s something I just need to archive for possible retrieval later, I file it in a folder in Outlook. I can always use Outlook’s search to find the email at any point later. If it’s information that has value outside of this specific email, I add it to my Evernote account using Evernote’s Outlook plug-in (Windows only for now). If you need to keep it, but none of the three previous actions work for you, then use something like Boomerang for Outlook or ClearContext to have the email returned to your inbox at a time where it will make more sense for you. Also, use this option for emails where you’ve replied and are expecting a response. Set your Boomerang to bring the original email back to your inbox when the time comes that you should follow up for that response. With the exception of Boomerang for Outlook and ClearContext, all of those tools have some kind of free option for you to use. There are ways of using Outlook exclusively to do all of these things, but this just the way that I have tackled my own inbox. 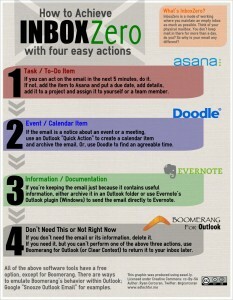 How do you maintain Inbox Zero? Use the comments below to share your own strategies.